Catherine of Braganza, the daughter of the King of Portugal, was born in 1638. 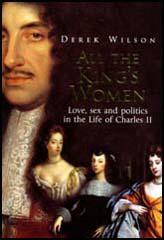 In 1662 she married Charles II. This failed to produce an heir but through his affairs with Nell Gwyn, Barbara Villiers, the Duchess of Portsmouth and Louise de Keroualle he fathered several children. After the death of Charles II in February 1685, Catherine returned to Portugal where she died in 1705.